A full-featured cellular automata simulator. The focus is on "Conway's Game of Life." With the 'Rule Panel' you can also explore other rule combinations. 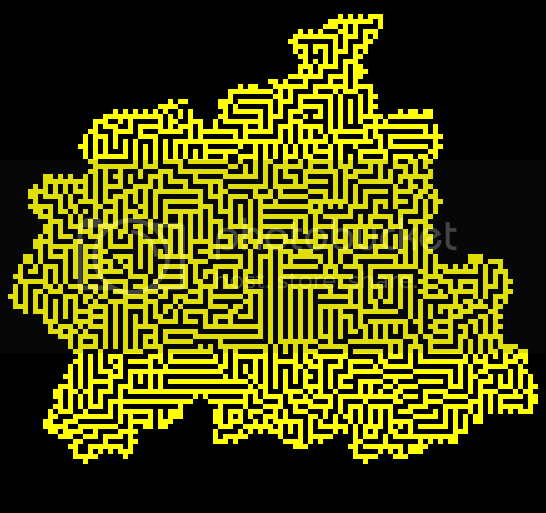 "Life as a Bit" is a cellular automata simulator. It defaults to the well known set of rules known as "Conway's Game of Life." A classic Conway Breeder added using the stamp interface. In draw mode add cells with the left mouse button and delete with the right. Magnification both with Zoom panel and scroll wheel. Panning with the arrow keys (and with the mouse in 'Grab Pan' mode). You know the Rules and so do I. Modify them here. Explore other interesting patterns of emergent life. Birth (3,3) and Survival (1,5) for an interesting maze-like growth. Birth (4,8) and Survival (1,7) creates interesting seemingly aperiodic closed oscillators. Birth (3,4) and Survival (1,5) creates very strange octagonal life. The above was generated with Birth (3,3) and Survival (1,5). "Life as a Bit" includes a database of well known and theoretically interesting patterns. Using the stamp mode you can place these in any orientation using the rotation and mirror copy buttons. A ghost image is also generated to assist in placement. information on the currently selected pattern will be displayed. "Life as a Bit" reads three common formats of life pattern file ('Life 1.05', 'Life 1.06', and 'Run-Length-Encoded'). the 'lifep' subdirectory of the program. The LifeWiki is a great place to find additional patterns and information. Pan with speed and ease using the mouse while in Grab-Pan mode. Cut (ctrl+x), copy (ctrl+c), and delete using the convenient Selector mode. Simply place your selector rectangle using the mouse. Cut and copied selections will be placed in the clipboard, and can be pasted in by pressing ctrl+v. Selections can then be rotated and mirrored just as a stamp would. If you would like to save the currently living cells on the screen press ctrl+s. Be aware however, the saved pattern will be named "savescreen.lif" and will be located in the "classic" directory. If you do not rename this file, the next time you save, it will be overwritten. o.0 Did you add any cells to the field, or just hit start without adding anything? ^_^ Done... New download is up with mouse button holding functional for both adding and deleting cells. Spawning during generation implemented. I also implemented/stole your method for generation calculation for the performance boost =P. Next comes zoom controls and panning I think. could you allow rendering to images? I would like to have a grid of 1920x1080, and an option would be nice. Hmm... Yeah I suppose image saving could be added fairly easily. Right now I am trying to get a new release of one of my other projects done though so I might not get to it for awhile. I do like those rule settings you posted; unfortunately they overpower my machine pretty fast. I don't follow you. You mean it was lots of work to code? If you think so then you may be pursuing the wrong hobby. It is a pretty short program in the greater scheme of things. Hey, I saw ur review! Glad you enjoyed it. I think the line puffer patterns are some of my favorites (but then I like a lot of them). Very cool application, but it always annoys me when people shove all of their game logic into one file. I prefer a more spread out, modular type thing, so I know exactly where to look when modifying things. ^_^ I understand. I actually started this program as a very minor side project and then it grew. The code could definitely be cleaned up more. Most of the GUI type things should probably be made into separate usable classes if nothing else; especially if I intend to ever reuse them in other programs. For the size of the program though, I don't know if I would bother creating more separate files or not though. Anyway, thanks for the download and hope you enjoyed it. Better than any other simulator, you can stamp. like this one, but pixels must be bought. Add many more gun designs. Load the Gopher gun and click run. Then try placing a pixel in front of the projectile; a big reaction will occur. Living "people" would be non-stable reactions occurring in the fortress. Walls could be penetrated by outgoing projectiles but nothing else. To generate a random seed, make random small bits. Then see if it grows big enough, one seed had only 5 pixels and lived for many minutes.